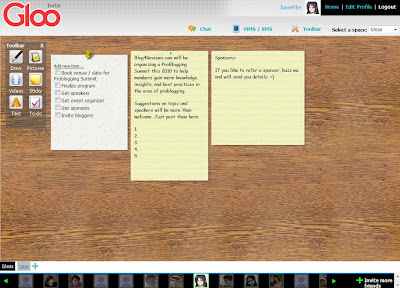 In preparing for the Blog4Reviews Christmas Party last December 17, I used Gloo as one way to keep in touch with blogger friends to get their thoughts about the upcoming event. Now that the event is over, I updated our space and using it to get inputs for the upcoming ProBlogging Summit that will happen this 2010. What I like about Gloo is its feeling of being part of a private network. For planners like me, this is important as there are project developments that I felt can be best shared in a closed network and engage those who are really active in the community. Send an SMS to those who are using a Globe phone and give updates directly to a specific space member. Chat with space members online. Add sticky notes and post details on them. Add a to-do-list to serve as a reminder. Pictures to be added to the site directly rather than point to 3rd party sites. Have the ability to update space members automatically through email or SMS. Ability to add multiple network cellphone numbers. I will be using the space as well to encourage folks to share contests and other activities happening online. One doesn't have to be a Globe Broadband subscriber to be able to access the service although I'm sure there are more features available to them exclusively. If you are a subscriber, inquire about Gloo and find out what perks you can enjoy with it. IMG_0309, originally uploaded by Juned I. Last October 24, I was in Cagayan De Oro for the 3rd Mindanao Bloggers Summit (MBS3) and Philippine Blog Awards Mindanao leg. Been very supportive of this community since its inception but this was my first time to attend. Congratulations CDO Bloggers and Mindanao Bloggers for this successful event. Thank you Chiq Montes and the rest of the team for inviting me as a resource person to your event. 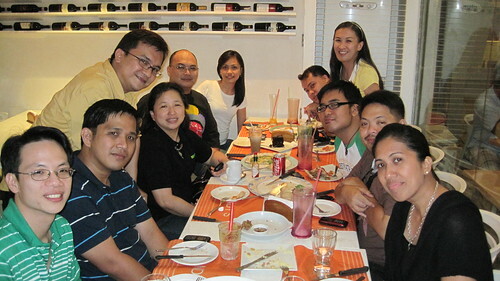 More so to DigitalFilipino Club member Syntactics' Honey Caragos for taking care of me. I have seen signs as to how this community is maturing. Will continuously observe its growth and support as needed. It also feels great to deliver a talk that connects with people. Hope to see Malaybalay and Kevin again in future events and chat. Look forward joining next year to support the 4th Mindanao Bloggers Summit in Zamboanga City! The new Google Real Time results makes me wonder on how blogging and search engine marketing will now change in order to be effective and attain a certain level of viral-ness. If social media and the response of users to your content will heavily influence search engine rankings in the future, then it means the more one must invest in building profiles and blog actively in sites like Tumblr and Yahoo! Meme. Of course this includes having a highly interactive account profile in Twitter and Plurk. Leave a comment or click on like to give a thumbs up to the content. The above actions can increase your followers from the community who are also as active. Post content that is meant to be passed on or to be discussed. It should be outstanding enough in order to merit such a response. Spread the word about new blog post from your site. You can use a photo from your blog post as an anchor and give a link to your blog post article. This applies to Tumblr and Yahoo Meme. Do you have a Tumblr, Twitter, Plurk, or a Yahoo Meme account? Share the url and will follow you. It will also be great if you can share how has it change the way you blog or share content. 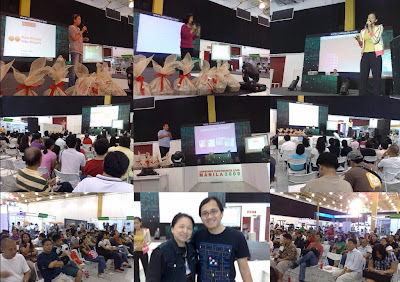 Last November 15, I was at the Consumer Electronics Live Manila event at World Trade Center to host iBlog Mini. Many thanks to UP-ISP head, Atty. JJ Disini for having the annual iBlog extended in this mega event. Big love also to fellow bloggers Micaela Rodriguez, Aileen Apolo, Noemi Lardizabal Dado, and Anton Diaz for sharing their valuable time to fellow bloggers on a Sunday. Gave a short talk about mobile blogging. Hope this blog post on photo and video blogging via the mobile phone will help. The event would not be complete without the generous snacks and raffle items from Summit Media and CEL Manila exhibitors shared to bloggers attending that day. Hats off to Donna Fuentes for helping us keeping the iBlog tradition where there is food and raffle galore. Thank you so much again to all who joined!